This is my first attempt at making paella. Paella is a rice dish from Spain that has become very popular with Brits in the U.K. Paella is not a dish I would have ordinarily attempted, namely because of the 'meaty' ingredients, but it was at my nephews request that I make a vegetarian version of paella when his Uncle returned home. I did not wish to disappoint him, so this is what we had this evening: Vegan 'prawns' and seitan chorizo paella. I know purists will be disappointed. For a start, I have not made it the authentic way using a paella pan, then I have missed out one of the essential ingredients - saffron strands that give the dish its golden colour (simply because I did not have any to hand). To add to this, I also veganized the dish and let me tell you it was good. The paprika and turmeric gave the dish its reddish colour and flavour. The last of the seitan chorizo gave it warmth. For those of you interested, I purchased the large vegan prawns from a Chinese supermarket in Glasgow. The vegan prawns are made from seaweed extract, gluten wheat, salt and spices. D repeated what he said once before about the vegan prawns that 'they tasted more like prawns than prawns did', this time my nephew agreed too. The paella certainly was a complete meal in itself, no accompaniments required – perhaps a glass of red wine though. MethodHeat the oil in a large frying pan and cook the onion until softened and golden. Add the red pepper, garlic and rice and stir fry for a couple of minutes. Then add the paprika, turmeric (or saffron) and stock, bring to the boil and simmer for 12 - 15 minutes. Whilst the pot is simmering, in a large frying pan heat 1 tablespoon oil and add the sliced seitan chorizo, cook for a minute on one side before flipping over and cooking on the other side. Turn off heat and set aside. Stir in the prawns and peas into the simmering pot and cook for a further 5 minutes, until the rice and vegetables are tender. Stir in the seitan choizo and season to taste, then serve immediately. Recipe veganized from Ainsley Harriots Gourmet Express 2. I am intrigued by the idea of vegan prawns! I'm getting a little bored with Quorn so will try and locate some seitan too. Thanks for highlighting some new ingredients! that looks really yummy. those prawns sound a lot better than the vegan seafood i just recently tried--faux shrimp and calamari made out of konjac root. they're shaped and colored just like the ones you used, but the texture...super weird. WOW!!! This dish looks amazing. J'aime beaucoup ta paella. Elle semble délicieuse. Yum, never heard of vegan prawns though, so will have to rush out to try and find some. Did they have a brand name Mangocheeks? Yuuum. I love Paella. I've made it twice so far and both times used turmeric because saffron is so expensive! So, the Wanderer has returned to the fold then... I'm sure he will be duly appreciative of some great Home Cooking once more. I'm going to be honest and say I would probably not like the dish you describe today (which is unusual!) because those "prawns" look and sound too "prawny" for me - I don't eat any fish or seafood. Fascinated by the vegan prawns - I never knew such a thing existed! Seriously...this dish looks awesome! Satisfying, hearty, and lots of flavor going on! I love the vegan prawns you found! I LOVE To see you bringing so many vegan dishes to the blog! THANKS!!!!! have a wonderful weekend! I did not know you could buy these vegan prawns. They look cool, I don't like the real ones, although I do cook them for my husband. I only learned of them two years ago at a Veggie Food Fair in London. Hope you find some where you are. I forgot to mention that these prawns had real texture too. I have to admit i had to google 'konjac root'. Wow, it does sound like it has a strange texture, one I don't think I would like. Firstly thanks for pointing out missing rice from the recipe list. It pleases me and makes me smile that the recipes do get read. Updated now. SEcondly, please don't be afriad of the vegan prawns, they were actually okay - a lot of texture. If you ever find some, please do give them a go. Thank you so much Health Seeker's Kitchen. I agree with you - the vegan prawns are soooo expensive! Its the first time I've purchased them (2 packets) and only as a curiosity treat whcih has now been satisfied. They were new to me up until two years ago when I went to a Veggie Fair in London. 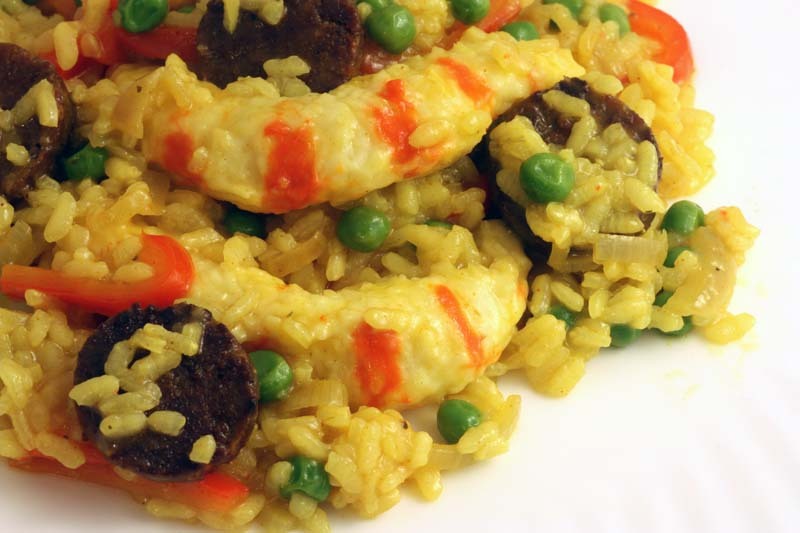 So pleased to read that turmeric in paella works for you too. I so agree saffron is expensive! The Wanderer has returned and has been very, very appreciative of Home Cooking without potatoes. Thank you so much for your honestly re not liking fishy flavours. I have to admit, I don't either, but my husband does - so as a compromise it was 'vegan seafood' - a little strange I know, but it did work. So pleased you liked the Marmite potatoes. Please do give it a go - they will be interesting! So pleased you are liking the vegan dishes. I think you will be pleased with my next offering too - Vegan Chocolate Gingerbread! Please do try and get hold of some, I think you won't mind them. 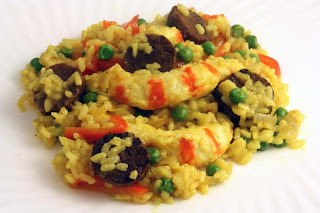 ooohh I do love Paella, we never use saffron here either, so expensive. Where do you get the Cherizo and Prawn vegetarian style? I purchased the 'prawns' from a Chinese Supermarket (See Woo) in Glasgow. A little pricey, but it was a novel treat. I know its very difficult to find vital wheat gluten in the U.K, so you may be interested to note that you can buy some at Holland and Barrett, but sadly its chopped up. I've just discoved your blog througha comment you left on mine! I'm looking forward to trying some of your yummy recipes! I've had those prawns a few times and think they're yummy! First for repaying hte compliment by coming by and secondly, Thank you for choosing to become a follower. It is very kind of you. It took me two years to track some down and they are a little pricey, but worth the treat I guess. Like you when I did eat meat, it was primarily fish and to be truthful, it was 'fish' and chips and thats all. I rarely ate seafood.